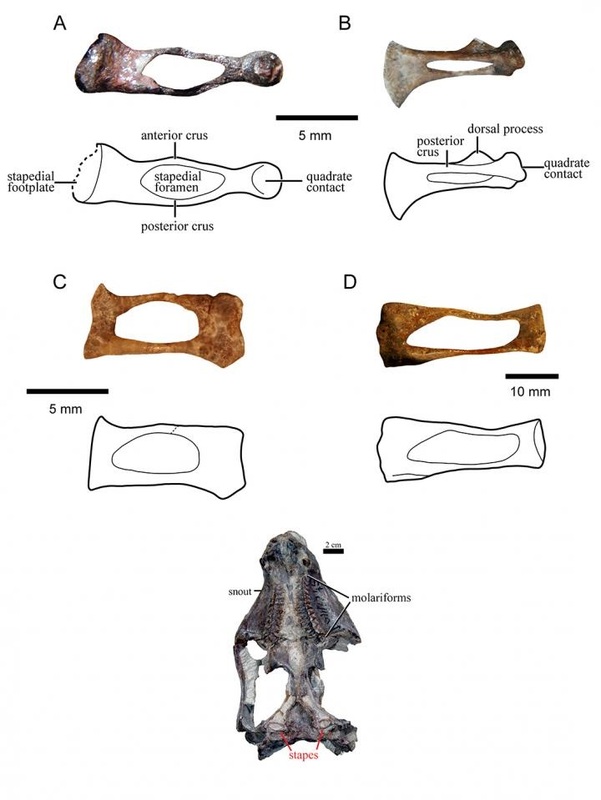 Now, Dr Leandro Gaetano and Professor Fernando Abdala from the University of the Witwatersrand’s Evolutionary Studies Institute (ESI) have completed the first detailed and comprehensive analysis on the ear bone of Triassic cynodonts, and have found some noticeable variations in the morphology of this bone – even among animals of the same species. “No one has really paid attention to this small bone before. In studying in this ear bone of Triassic cynodonts – the forerunners of mammals, including humans – the past two years we now start to see these differences,” says Gaetano. Results from this study, which is only the first part of a more inclusive research project, will appear in a paper, titled: The stapes of gomphodont cynodonts: insights into the middle ear structure of non-mammaliaform cynodonts, in the journal, PLOS ONE, on Wednesday, 15 July 2015, at 20:00 (SATS). The only ear bone in mammalian ancestors, the stapes – or stirrup in Latin, to which this bone is most similar in humans – has been recorded in many Triassic cynodonts (220 – 250 million years ago). The stapes is a rectangular bone with a hole in the middle surrounded by anterior and posterior bone columns. It is the only bone of the middle ear and allowed for the transmission of the sound waves from the eardrum to the inner ear. “Few contributions studied the stapes in cynodonts and it has been historically regarded as a conservative element, showing no differences among species. Surprisingly, we discovered that there are noticeable variations in the morphology of this bone, even within representatives of the same species,” says Gaetano. One of the major unsolved issues regarding the ear of cynodonts has to do with the eardrum position and characteristics, for which three competing main theories have been proposed. “The cynodont stapes suggests that the sound waves in these animals were transmitted to the inner ear from an eardrum at the posterior part of the lower jaw through the stapes and the quadrate bones,” says Abdala. He adds that their research are ongoing as they do not know yet whether the differences also imply different hearing capabilities as well and their more in-depth research will focus on how this bone changes from the youngest to the oldest animal in one species. Gaetano and Abdala’s contribution results in a better understanding of the auditory system in basal cynodonts and its evolution, highlighting the variability of the middle ear bone anatomy. They are currently studying the change in this bone during growth in a South African Triassic cynodont.